Babe Ruth's autograph graces this 1915 WS check request made by the Boston Red Sox. It originated from the August Herrmann archive. Once again, Heritage Auction Galleries of Dallas, Texas, is offering a rare document for sale believed to have been stolen from the Baseball Hall of Fame’s famous August Herrmann Papers collection. Selling documents stolen from the Hall of Fame has become a regular occurrence at Heritage as has offering stolen photos as we exposed in an article we wrote for Deadspin last Spring. 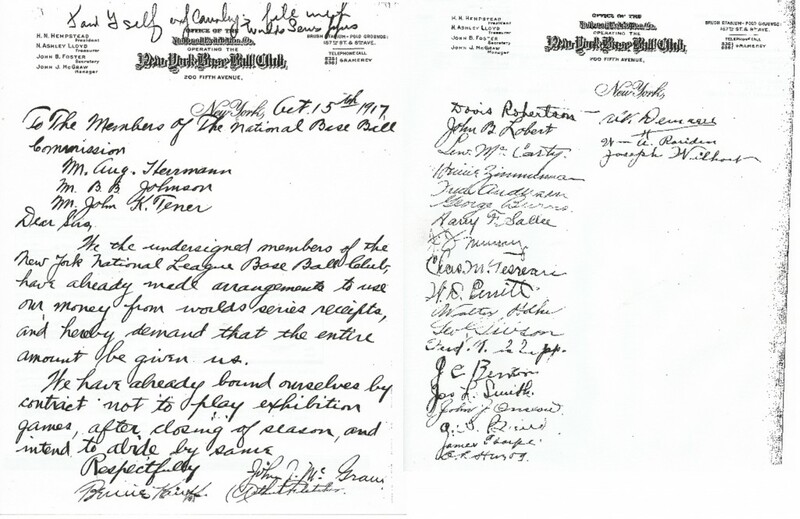 The current questioned document is a 1915 check request sent by Babe Ruth and his Red Sox teammates to August Herrmann’s National Commission, the ruling body in Baseball before a Commissioners office was established. Dated October 8, 1915, the letter is addressed to Herrmann’s underling and Commission Secretary, John E. Bruce, and grants the permission from all the undersigned Red Sox that manager Bill Carrigan can accept a check on their behalf representing their players share for the 1915 World Series against the Philadelphia Phillies. Babe Ruth, Tris Speaker, Harry Hooper, Smoky Joe Wood and the entire Red Sox team signed the document which is now open for bidding on the auction house’s website and scheduled to be sold at Heritage’s live Platinum auction event in New York City on February 23rd. The National Baseball Library in Cooperstown houses the World Series papers of the National Commission, which includes comprehensive correspondence related to everything from ticket sales to awards to the travel expenses of umpires. The files still hold several World Series check request letters, however, the 1915 Red Sox request, among others, is curiously absent. On Heritage’s website the document currently has a bid of $38,837 and is accompanied by an LOA from Jimmy Spence and JSA. 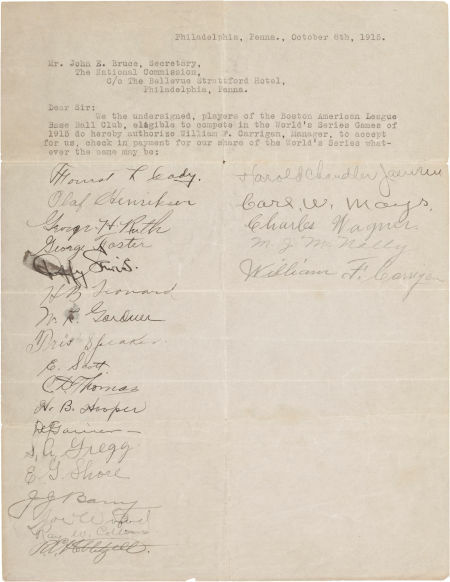 This 1915 request for World Series share money for the Red Sox was signed by Babe Ruth and his teammates and sent to Baseball's National Commission. It is believed to have originated from the HOFs Herrmann Papers Archive. The same letter was also sold in 2001 by Federally indicted ex-hobby kingpin, Bill Mastro, at a MastroNet auction as lot 694 for close to $10,000 and was offered with another World Series check request (lot 698) written by John J. McGraw and his 1917 New York Giants, which sold for close to $3,000. MastroNet did not include any information regarding the provenance of either document other than to mention that the 1915 Red Sox letter included “absolutely remarkable” signatures and was “a unique document of museum quality.” Both letters were authenticated by Mike Gutierrez for MastroNet and James Spence for PSA/DNA. John Bruce (far right) sits with (from l to r) Harry Pulliam, August Herrmann and Ban Johnson. If looks could kill: Herrmann & Co. might have similar looks on their faces if informed of the HOF thefts of their papers. Gutierrez was at the center of a late 1980s FBI investigation into thefts at the Baseball Hall of Fame after he sold a signed photograph of Babe Ruth to auctioneer Josh Evans that was stolen from the National Baseball Library. The photograph had a Hall of Fame accession number covered with white-out and after Evans reported the incident to Hall officials, Gutierrez became the prime suspect for both the FBI and state prosecutors. 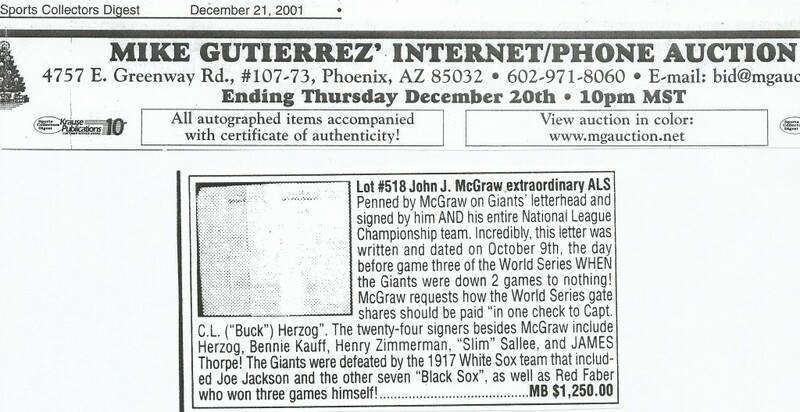 In 1998, an anonymous source told hobby newsletter The Sweet Spot that he had accompanied Mike Gutierrez on a visit to the National Baseball Library and said of Gutierrez: “He would go to the photocopy machine, make copies of some of the documents; he made neat stacks of copies,” the witness said. “For every 10 items he’d take to the machine, however, nine originals would return to the file. One original would be mixed in with the copies and they would go directly into his briefcase. That briefcase would never leave his side.” The eyewitness also indicated that the documents Gutierrez was copying were from the Hall’s Herrmann Papers collection. Gutierrez is one of Heritage’s current consignment directors and a regular on-air appraiser of sports memorabilia for PBS and Antiques Roadshow. 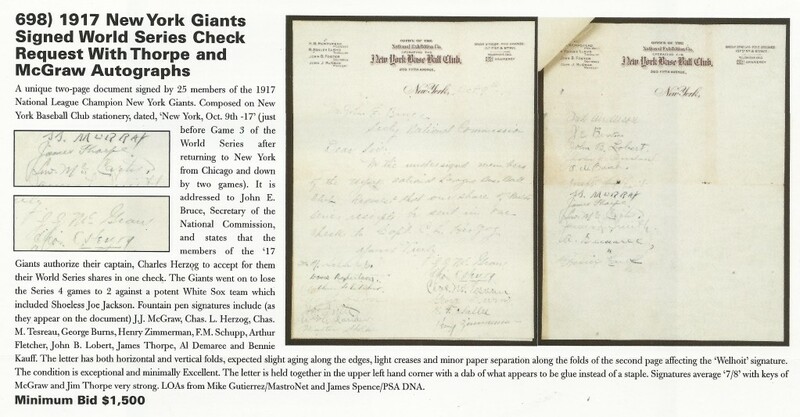 In 2001, Gutierrez’ auction, MGA Auctions offered the 1917 New York Giant check request letter in a Sports Collectors Digest auction just months after it was sold by MastroNet, who was also his employer. 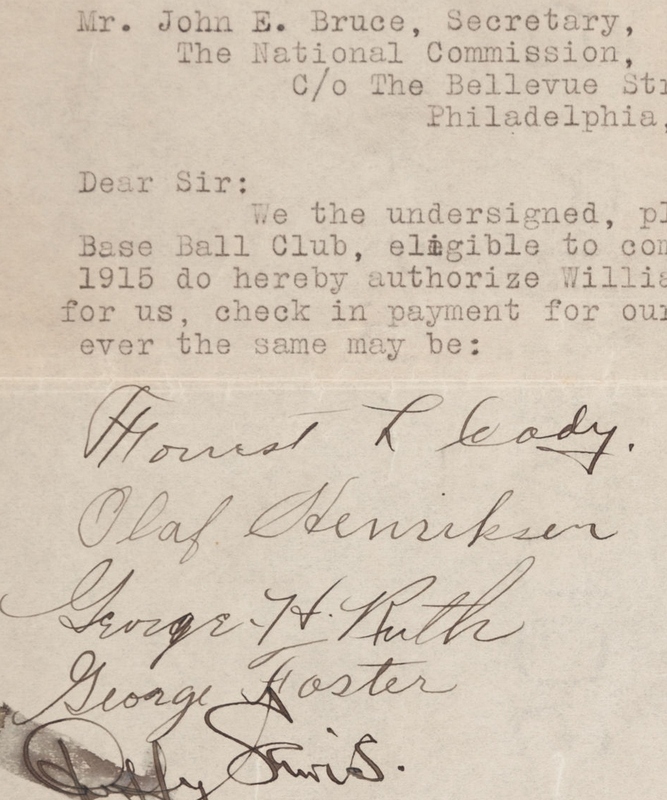 Mike Gutierrez offered the 1917 New York Giant team-signed WS check request in his 2001 MGA Auctions sale. The Hall’s Herrmann Papers archive includes documents related to protested games, the World Series, player contracts, player discipline and virtually ever aspect involved in the business of Major League Baseball. 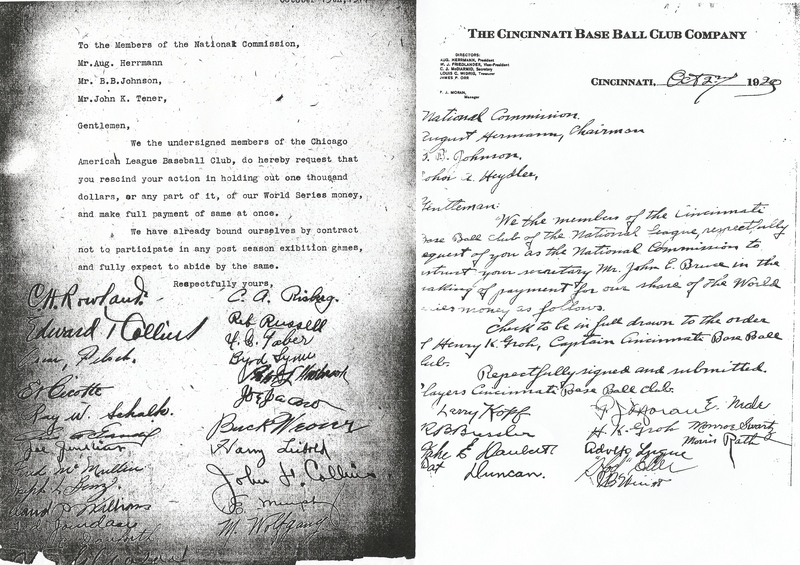 It includes all of the correspondence to Herrmann in relation to the National Commission as well as all of his day to day records as owner of the Cincinnati Reds from 1902 through the 1920s. The current Heritage offering of the 1915 Red Sox WS request also appeared with this 1917 NY Giant request in a 2001 MastroNet auction. Both documents originated from the HOFs Herrmmann Papers archive. While any such team-signed document addressed to Herrmann’s Commission (like the 1915 Red Sox check request), had to have originated from his files, the 1917 Giant check request illustrates best the likelihood that these documents were stolen from the Hall in the 1980s heist of well over $1 million in donated materials. The New York Giant letter offered by Mastro and Gutierrez in 2001 was dated October 9, 1917 and apparently wasn’t addressed or paid promptly by Herrmann and the Commission. On October 15, 1917, the Giants wrote a second demand letter for their World Series money. 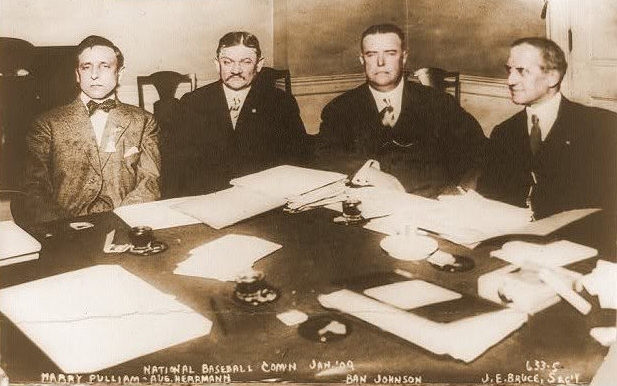 In the letter addressed to the Commission including Herrmann, Ban Johnson and John Tener, manager John McGraw claims that all of the players who signed both requiest letters “have already made arrangements to use our money from World Series receipts.” Unlike, the letter sold by Gutierrez and Mastro, this letter still resides in the National Baseball Library in the Herrmann archive’s World Series files. In fact, at the top of the letter Herrmann hand wrote in pencil the notation: ”File with World Series Papers.” In addition to that letter request, the NBLs files still contain the check request from the 1917 champion White Sox. This 1917 WS check request from the New York Giants to the National Commission is currently found in the files of the National Baseball Library's Herrmann Papers archive. The Herrmann Papers archive was donated to the Hall in 1960 by Reds owner Powel Crosley Jr. and also includes other requests for World Series monies including team-signed letters from Hermann’s Reds requesting their share of the fixed 1919 Series and the 1917 request made by the Chicago White Sox signed by the “Eight-Men Out” including Eddie Cicotte, Buck Weaver and “Shoeless” Joe Jackson. Considering how many valuable and rare signatures have been documented as stolen from the Herrmann archive it is surprising that the Jackson-signed document is still in Cooperstown, now protected in an archival sleeve. A 1917 White Sox request for WS money, signed by "Shoeless" Joe Jackson, and a 1920 request signed by the 1919 Reds are still part of the HOFs Herrmann archive. (National Baseball Library, Cooperstown). 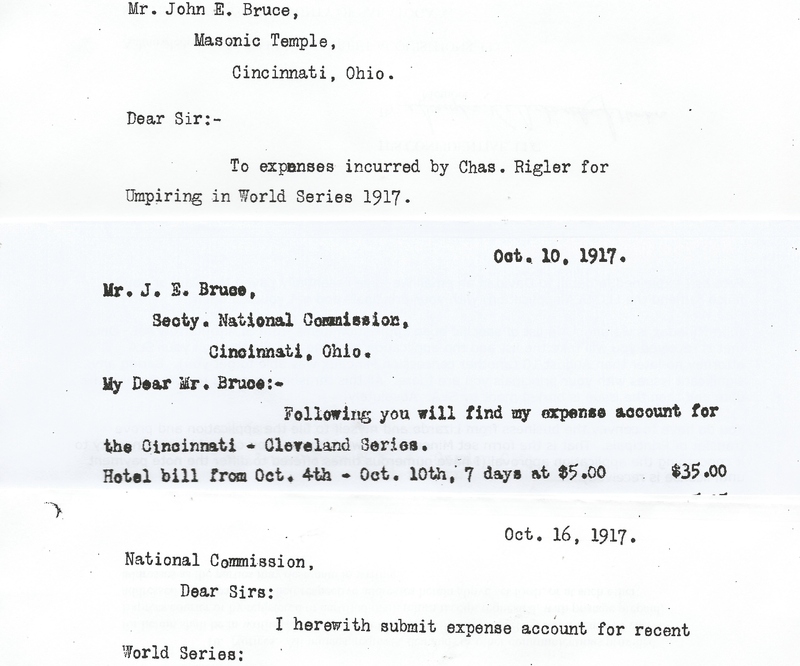 The 1915 and 1917 letters to the Commission are also addressed to Herrmann’s Commission’s secretary, John E. Bruce, who dealt with financial considerations for Baseball’s governing body. The file for Herrmann’s 1915 World Series documents includes several other letters addressed to Bruce dealing with the travel expenses for umpires Bill Klem and John Rigler who traveled between New York and Chicago for the Series. The HOFs Herrmann Archive includes a file devoted to the 1915 World Series with several letters addressed to Commission Secretary John Bruce. (National Baseball Library, Cooperstown). Letters suspected to have been stolen from the Hall of Fame’s collection have been appearing at auction since the early 1990s with several having direct links to Heritage’s Mike Gutierrez. Heritage has removed several Herrmann documents from previous sales written by HOFers Fred Clarke, Joe Tinker, Charles Comiskey, Ban Johnson and others. Other Herrmann documents have appeared in sales held by Superior Galleries in Beverly Hills, CA., and at Richard Wolfers Auctions in San Francisco, CA., at times when Gutierrez was employed as a consultant or employee of those two companies. HOF Chairman Jane Forbes Clark and President Jeff Idelson have dropped the ball in recovering stolen artifacts. Their predecessors dropped the ball in prosecuting suspect Mike Gutierrez (right). Babe Ruth’s granddaughter, Linda Ruth Tosetti, is disturbed by the sale of stolen and historic artifacts linked to her grandfather. Tosetti has played a key role in helping recover other stolen documents like Babe Ruth’s will, which vanished from a New York City courthouse. Outspoken in support of the memory of the Babe, her public statements raised awareness and helped the FBI and the NY State Attorney General finally recover the stolen will. Upon hearing about the 1915 Ruth letter being offered by Heritage Tosseti said, “My grandfather donated his personal awards and artifacts to the Hall of Fame, and the State of New York with a trust that they be kept safe in perpetuity, to enrich baseball history for future generations. The Hall of Fame, and the State of New York have a responsibility to take care of said items. Chris Ivy, Heritage’s director of Sports Auctions and son of Heritage CEO, Steve Ivy, did not respond to our inquiries about the provenance on the Red Sox letter and the authenticity of the Ruth plaque. Another recent Haulsofshame.com investigation confirmed that Ivy and Heritage had sold another item stolen from the Hall of Fame, a rare photo of the 1886 New York Giants for over $10,000. Ivy has still not indicated if that item has been returned to Cooperstown. Recently, Haulsofshame.com has published stories revealing that, in addition to the Herrmann archive, other collections at the Hall have been compromised including 19th century photographs, the Ford Frick Correspondence files and the Frederick Long Papers Collection. Haulsofshame.com contacted Hall of Fame Chairman Jane Forbes Clark for comment at her Clark Estates office at Rockefeller Center in New York City, but Clark did not respond or issue a statement regarding the Heritage offering or the issue of theft from the Hall. Upcoming Haulsofshame.com reports will also show that the papers of Clark’s grandfather (and Hall of Fame founder), Stephen C. Clark, have also been looted by library thieves. Clark refused to comment on that issue as well. Clark is the sole heir to the Singer Sewing Machine fortune and one of the richest women in America. “A boy wearing a black No. 5 David Wright Mets jersey won the stick for $262,900 and the jersey for $286,800 at a sports memorabilia auction Saturday night. Eruzione’s Miracle on Ice jersey, not the one he wore in the gold-medal game against Finland that Seven won, fetched the highest amount, $657,250, of every lot in a three-hour, $5 million, 134-item session at Fletcher-Sinclair mansion. Seven, who is not named after Mickey Mantle, watched the movie “Miracle” for the first time this week. “It was all he talked about for three days,” his father said. A kid named "Seven" is said to have won the 1915 Red Sox document believed to have been stolen from the HOFs Herrmann Papers archive. 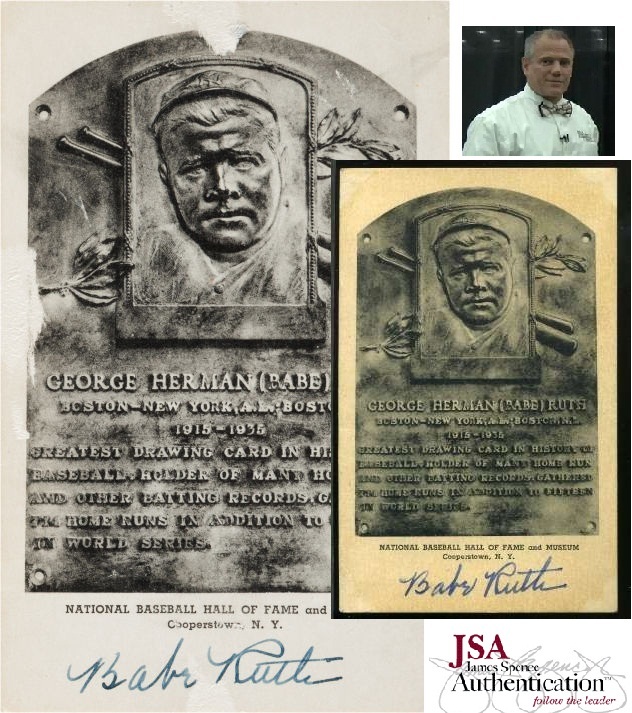 Heritage's black and white HOF plaque allegedly signed by Babe Ruth and authenticated by Jimmy Spence (inset) contrasts an authentic example (inset) sold by Philip Weisss auctions in 2009. Also being offered in Heritage’s live auction extravaganza is another item with ties to Baseball’s Hall of Fame, a black and white souvenir postcard depicting the Bambino’s bronze plaque which was allegedly signed by Ruth. The item was authenticated by JSA’s Jimmy Spence and the auction house estimates the value of the signed postcard as exceeding $50,000. The current bid stands at $16,000. The alleged Ruth signed plaque authenticated by JSA (top) differs from the JSA authenticated plaque sold at Philip Weiss Auctions and also authenticated by Jimmy Spence. Black and white HOF plaques produced by the Albertype company are rarely found bearing the authentic signature of Ruth and an authentic example was sold at Philip Weiss Auctions in Long Island in 2009 for $62,150. In contrast to that authentic example, the Heritage offering, authenticated by Spence, does not appear to be a favorite of expert Ron Keurajian, author of the book, Baseball Hall of Fame Autographs: A Reference Guide. Keurajian references the authentic plaque sold by Philip Weiss in a section in his book devoted to signed Hall of Fame postcard plaques. According to Keurajian it is the only authentic Ruth autographed HOF plaque-postcard known to exist. 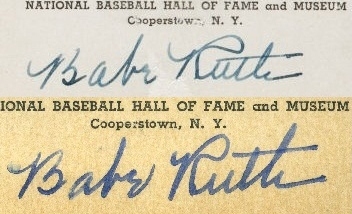 REA sold a HOF plaque with this alleged signature of Ruth for $44,062.50 in 2008. Back in 2008, Robert Edward Auctions sold an alleged Ruth signature on a HOF “Sepia Plaque” that pre-dated the Albertype plaques and were produced between 1939 and 1943. However, according to assertions made by Keurajian in his book, this autograph, authenticated and slabbed by PSA, is also not genuine. 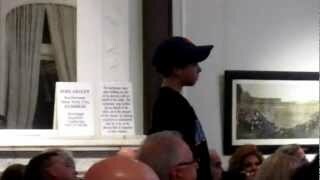 For more coverage on controversial Babe Ruth memorabilia up for auction and the Bill Mastro Hearings click: here. I am shocked, shocked to find gambling in this establishment, oops, and also shocked to find that Heritage continues to sell documents of questionable provenance. And I am shocked, shocked to read about the allegations against Mike Gutierrez. I love reading this stuff. Especially the Mastro Fiasco, as I call it. Just want to let you know that your efforts are appreciated. I have two other guys in my office that want me to forward these emails to them, so three people read this one email. Should I tell them to subscribe and get your subscription number up? If mike g gets canned from heritage and antiques roadshow he could always get a job as jane clarks butler. Thanks. Sure, just have them sign up on the newsletter and they will get them. Mr. Nash– thanks for being one of the truly good guys in the industry and making sure that nothing is concealed in this wonderful hobby of ours so that we can all enjoy it more. I think I speak for everyone when I say we owe you a debt of gratitude for all your work. If there is any justice, these guys are going to be forging license plates at Sing Sing. I told you the Hall of Fame was a sham. Tsk. Tsk. Tsk. All these articles are great. However, I wonder if you could spend some time on how to police or improve the authentication processes at these authenticators? You point out the problem extensively, but how about some solutions? Maybe a rating system of places like JSA, PSA, AMA, AAU? Which are the most reliable? Which have the more credible authenticators? Which ones have the best track record? I love your articles but they are devoted to only one side of the coin. Im leaving this comment under an assumed name. If i didnt the crooks at Heritage would ban me from their auctions. A big problem in the hobby is a collectors instinct to overlook these issues in pursuit of additions to the collection. In that respect, I’m part of the problem. That being said, Heritage’s continued sales of letters stolen from the HOF and their continued employment of mike gutierrez is a travesty.His looting of the Herrmann files is grand larceny on the highest level. The Hall of Fame’s cover up is a bigger crime. The Babe’s Granddaughter hit that one out of the park like her grandfather would have. Why hasn’t HOS in all of its coverage of the Hall robberies ever spoken to the eyewitness to Mike G at the HOF copy machine? Why no interview with Mr. Jasperson? What really gets my goat, is the fact that the FBI doesnt step in and close down Heritage and the Hall and hold a investigation into both of them, seeing as there is so much eveidence aganist them all,including Guterrez and go after him also, for extensive investgation. To the person who doesnt want to get banned from Heritage auctions,why in hell would you want to continue to do business with a bunch of crooks,cause in a way,it makes you look just as bad for condoling their actions, when you know they are crooked and thieves.I for one wouldnt want to associated with any of them for the fear of being busted for having their stolen items and it would make you a accomplice. 41,824 is now the bid on the red sox letter. At least one person doesnt mind buying something stolen. How would anyone know if that is a real bid when dealing with Heritage? Well,he might be the leading bidder,but in the end, could end up paying a lot more then his bid,if he gets nailed with stolen goods,some people are fools and dont do their homework before putting themselves in awkward positions. Now its at 50,000 or is it? Says 50,000 reserve. Werethe other bids not real and just house bids? Isnt mastro getting locked up for that type of stuff. Or does heritage screw bidders legally. Why would your site post a picture of an boy not involved in the controversy of the 1915 Red Sox piece. Does mentioning the boy into the story help aid in proving the origin of the piece. I feel badly for the boy and his family being place in this crossfire. Hopefully you will remove his name and face associated with the bad press. Sports Illustrated reported that the boy and father bid and won the letter, there is a full you tube video posted of him buying the Eruzione stick and other sites posted photos of him from the video. In my opinion he and the father purchased a letter likely stolen from the NBL. Obviously, Heritage made no effort to inform bidders of the controversy and the evidence presented in our article. Instead, they chose to sell the letter because the Hall of Fame did not take action like the Augusta National Golf Club did with the Masters Jacket they planned to sell. Are we not to report where the letter is going or who purchased it because a youth was involved in the bidding (in a public forum no less)? I understand your comment, but I do think the coverage is warranted. The fact that the kids name is “Seven” (and the inevitable Seinfeld references that followed), I will admit, made me even more interested in covering the purchase. Oh my gosh, you printed a (lousy quality) picture of the kid. You ruined his life forever, and put him at incredible danger!! Now he is going to have to grow a beard in an effort to disguise himself. He might even have to change his name from Seven to something else.